It is amazing what the sound of hundreds of migrating Tundra swans can do to my soul...or the sound of just one. Early Wednesday morning I caught the sound of one small flock migrating high overhead, their white forms floating against a steely gray sky. My heart jumped, pulse quickened, excitement rose! They were back! What had started out as a cold, rainy, dark day suddenly seemed full of wonder and promise! Ever since I first heard the sound and witnessed the sight of them flying overhead several years ago, I have been enchanted by "cloud phantoms" with melodious barking voices. They seem magical and other worldly to me. 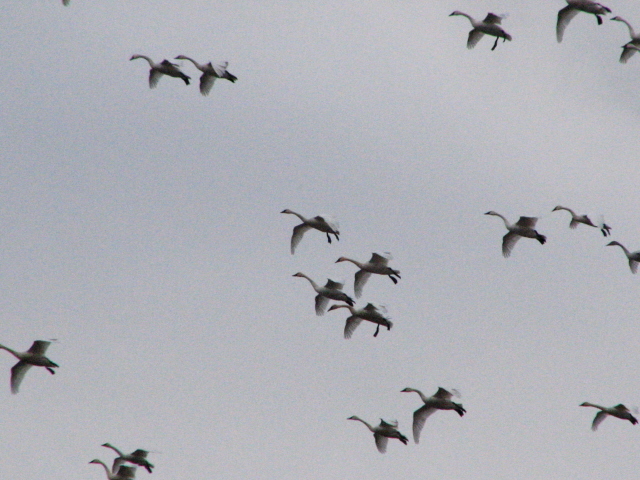 They always seem to migrate through on days that are dark and overcast or during the night when their calls sound eerie in the darkness and their forms float by spirit-like overhead. I found them later in the day resting at Mann Lake, a small reservoir, near my home. 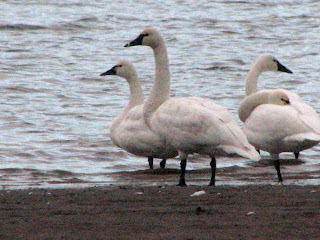 There were several crazed bird watchers like me in attendance with spotting scopes, binoculars and cameras with powerful telephoto lenses, all of us excitedly chatting about the nearly 1000 swans that had graced us with their presence during the night. I took at least 100 photos to record the event and for reference in future paintings. Eventually, I had to tear myself away and head home. 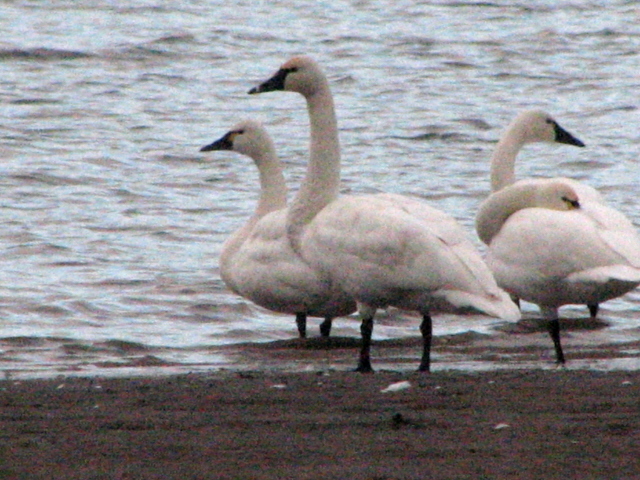 I had hoped to see the swans one more time, but when I visited the reservoir this morning all, but four, were gone. What a great blessing it was to see them though! I am mulling around some ideas for paintings now, but I'm not sure I will ever be able to capture how I feel when I see them flying. That may be something held in my heart, a gift from God just for me. I will try, of course, but until you stand shivering under a steely gray sky, listening for their cries, straining your eyes to see them float down from the heavens, you will never truly understand their magic. I love watching birds! I have been a bird watcher from the time I was a little girl sitting contentedly on my grandparents porch peering into a bush and watching in utter fascination a pair of song sparrows feeding their young. I spent hours out their studying them closely, making drawings and notes of everything they did. ( Oh, how I wish I still had that first notebook!) I have never outgrown that fascination and as an adult I make an effort to attract as many birds to my yard as I can by growing plants they love to eat and use for cover, putting out feeders and providing water. I have been pretty successful in attracting hummingbirds, doves, gold finches, lesser gold finches, and many others that migrate through. I always have birds in my yard of some kind looking for a free and easy meal. My politically incorrect husband lovingly calls them my "welfare" birds. 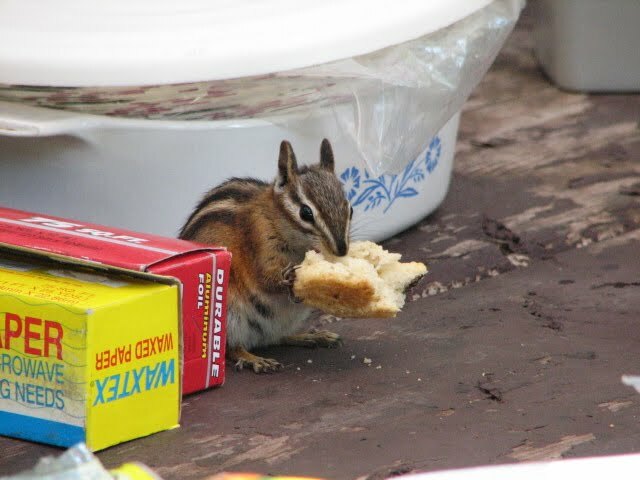 Yesterday, as I was getting ready to leave for work, I took one last glance out the patio door at all my feathered friends madly feasting away. I picked up my keys and looked again only this time I saw only one bird...a very LARGE bird...one with very sharp talons, a hooked beak and a fearsome gaze! A Cooper's hawk had just swooped into my yard hoping to get breakfast, too. Only he was not interested in seeds. He was hoping for a nice fat sparrow! 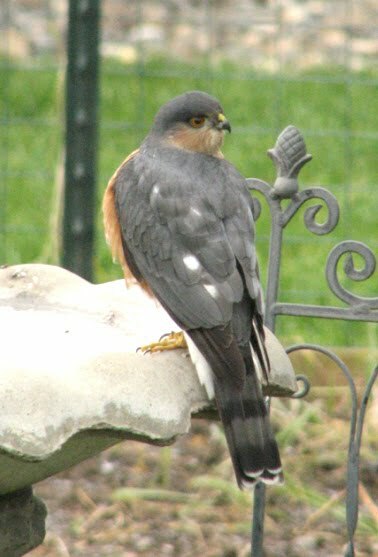 I ran for my camera and as I watched this awesome bird of prey eying all the places the smaller birds had hidden, I realized he had a place in my yard, too. Some people get quite upset when a hawk swoops in and makes a meal out of one of their song birds, but I love to see the predator birds. By providing a food source for the smaller birds I am also providing a food source for the birds that prey on them, giving me an opportunity to study those birds up close and from the comfort of my own home. 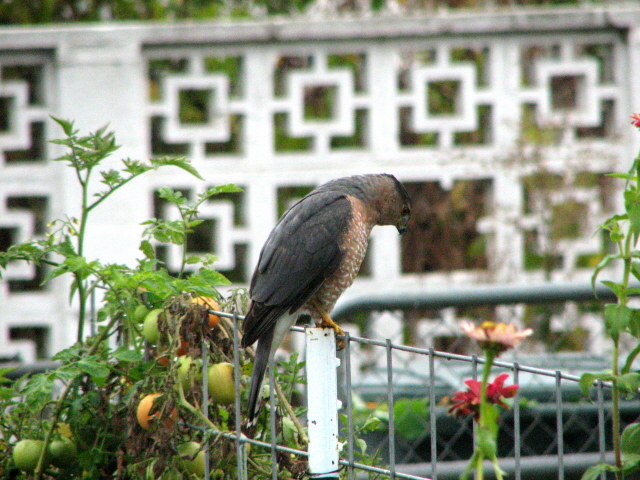 In a short while the Cooper's flew off, but not until he had hopped down from his perch and peered closely into the tomato plant where the little birds often hide. I thought his behavior was interesting especially since I had just read an article in Bird Watcher's Digest the evening before describing similar behavior. 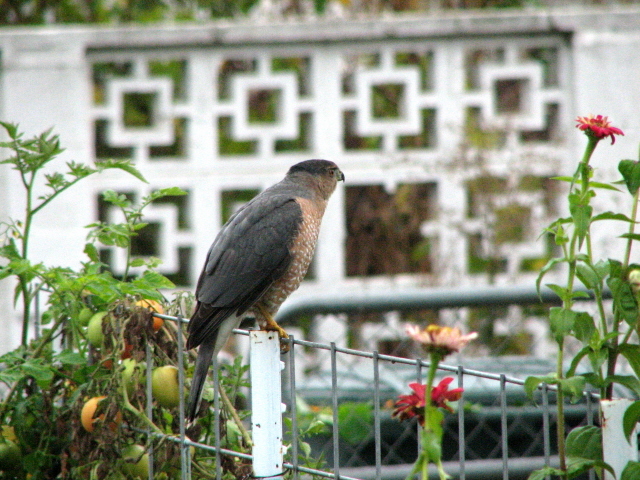 I found it even more interesting that I had read the article, and had just that morning given thought to whether I would see any Coopers in my yard this fall and, amazingly, there he was! It was a great article and if you're interested in birds I'd recommend getting a copy for yourself. Birds of prey are not bad birds, it's just how they were created and if you take the time to study one you'll find they are well equipped to be what they are. Exceptional eyesight and swift maneuverability make them superb hunters. Strong feet, sharp talons and hooked beaks are the utensils they use to eat with, specialized to what they eat, just like hummingbirds have long bills and tongues because they sip nectar. Try to remember that if the thought of birds of prey bothers you any. They are a part of nature just like the pretty birds. In some ways I like them better because of the awesome power they seem to exude. Late this summer I had the privilege of meeting a very nice couple from Kansas who were visiting a past client and friend. They had seen a portrait I had done some years back of their dog, Hannah, and were impressed enough to want to take some time out from their holiday to meet me. The couple was wonderful and the lady got quite excited looking at my portfolio and envisioning their pets in a portrait. I gave them all the information about photos I would need, prices, etc. and they said they would get back to me when they returned home. 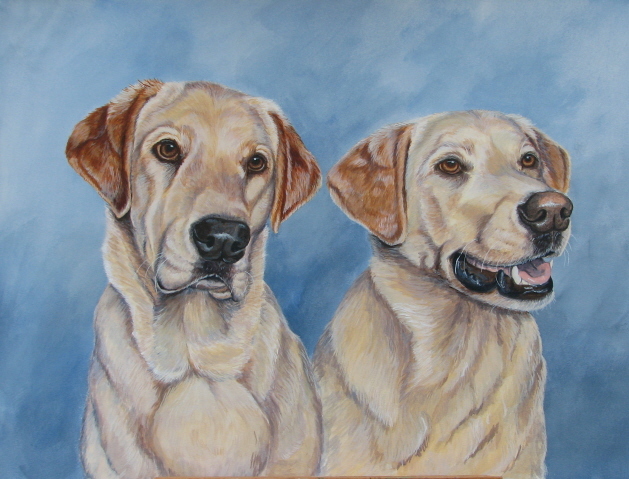 A few months later I got an email from the husband who wanted to secretly get a portrait done of their two yellow labs, Mackenzie and Finley, for his wife's birthday. ( I love all this secret stuff!) After exchanging several emails to decide on the poses we came up with this portrait. This painting was done in acrylic, but I also added a little bit of gouache for the finest details as I find it flows better off the brush and is very opaque. Any place that I wanted to add a brighter highlight or to accent individual hairs like the whiskers I painted with gouache. The nice thing about using water media is that they are interchangeable and can easily be used together. It was also great fun to paint the shadows in their coats as I could use colors like soft blues and lavenders. I have a few weeks to wait now until my clients wife opens her birthday present, but I have been told a phone call telling me how well she liked it won't be necessary. I should be able to hear her screaming excitedly all the way from Kansas!! 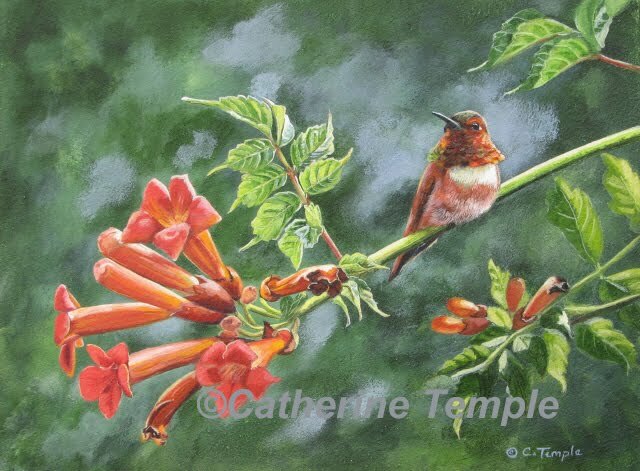 "Rufous and Trumpet Vine" is now officially finished! After collecting more reference material of the trumpet vine I chose another small clump of flowers and added it into the lower right hand corner. I painted it slightly softer and less distinct than the larger clump to help it recede a bit into the background giving the composition a little more depth. I also tweaked the background color slightly adding a little more blue and brightening it up a bit behind the hummingbird to make him stand out just a little more. The painting is 8" x 10" painted on an Ampersand gesso panel in acrylic. It is available for sale in my Etsy store...www.ctempleart.etsy.com. Just click on the link and it will take you right to him. You will also find other nature inspired paintings there sure to please any bird watcher or nature lover. Dog lovers will find something there, too. I'm not sure what my next painting will be...bird, beast or dog. My thoughts right now are tuned in to getting a portfolio together to submit to the Western Art Association for their Ellensburg show next May of which I'd love to be a part of. But I am sifting through current reference and my walks every day always bring additional inspiration. As always, thanks for looking and be blessed today by the natural treasures this earth holds! 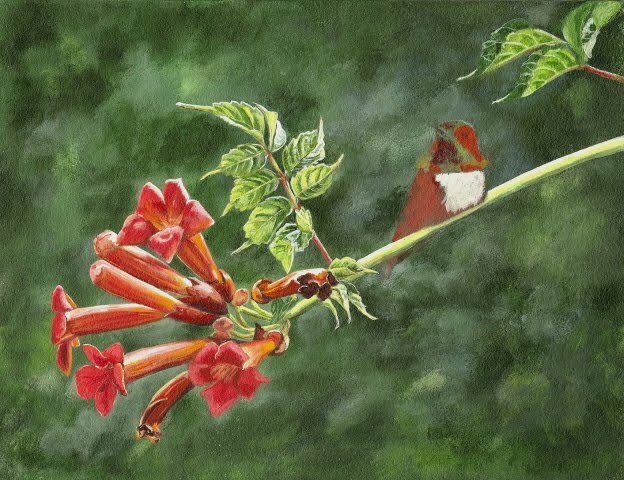 A few weeks back I started a new acrylic painting of a rufous hummingbird perched in a trumpet vine. 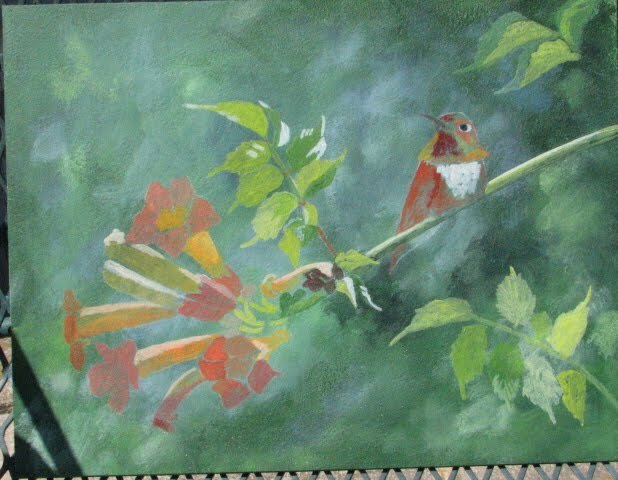 I really liked the combination of oranges and greens in the flowers and the bird and the way the dappled sunlight illuminated everything and made it glow. I chose to keep the background very vague so that as I add detail it should create a lot of depth to the painting. With the background finished I transferred my drawing and got started. In this next stage I have just blocked in the basic colors and shapes. It's very rough, but it gives me an idea of how things will really look and I will make adjustments as I paint. Now things are really starting to take shape! I have completed the flowers and leaves building them up gradually. The leaves in the lower right corner were bothering me so at this point I have painted them out. One of the nice things about acrylic is that you can make lots of changes and adjustments as you go because they dry so quickly. In a matter of minutes I could paint new leaves back in if I wanted, but for now I'm leaving them out until I decide what I want to do with that corner. In my reference sketch it looked okay, but somehow it didn't when I started to paint it. The male Rufous hummingbird is now pretty much complete. I can see there will be a few adjustments on him, but not too many. 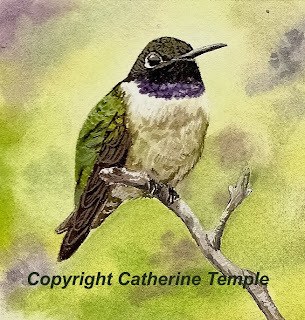 I love the way the sun catches the metallic iridescence on his gorget and that's what drew me to paint him as he zipped around my yard guarding the feeders. Now the painting is in what I call my "sit and look" stage. I have completed the main components, but I'm still not happy with that lower right corner. It seems to need something....perhaps more flowers or leaves going in a different direction. I will be going through my trumpet vine reference again for additional inspiration and if need be will head out to take more reference photos. What I'm thinking at this point is that it may need one more small clump of flowers. Three spots of orange may make it more balanced. Guess it's time to head back to the studio and see what other ideas I can come up with. Check back soon and see what happens! 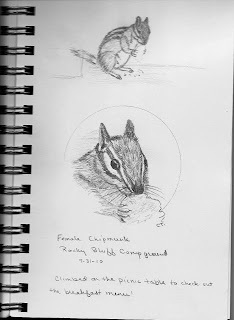 From photos and sketches to finished painting, here again is the little chipmunk from my camping trip. I had so many poses to choose from, but I particularly liked this one of her in the sunlight on an old stump. This painting is done in watercolor and gouache, but I may attempt another in acrylic in a few days. I just got a DVD on some new acrylic painting techniques and since she is so fresh in my mind and just so darn cute I may practice the techniques with another painting. 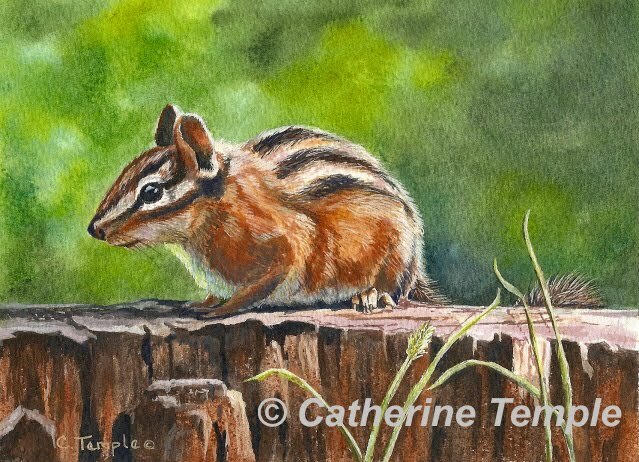 "Rocky Bluff Chipmunk" is for sale to the first person asking nice and can be found in my Etsy shop by clicking HERE. Hey! A lot has been happening here lately and I feel like I've been running full speed for the last few weeks. So much for the lazy, "dog days" of summer! As you can see by the photo one of the new developments is a new hairdo. I'm now sporting a short, sporty hairstyle. Definitely cooler this time of year and really pretty easy care! 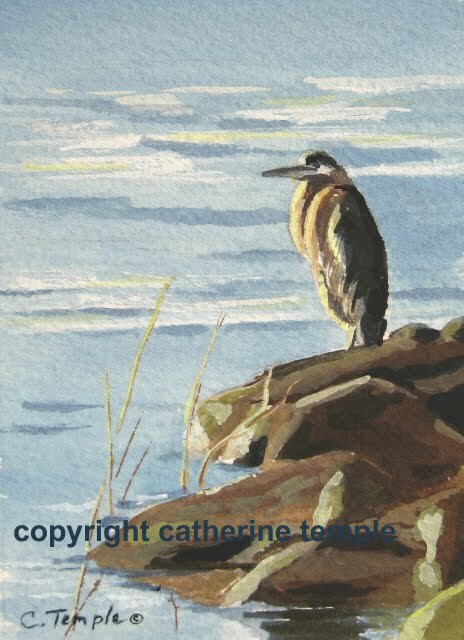 Most of the news though and what I'm really excited about is my new website www.catherinetemple.com featuring not only my pet portrait and dog art, but also my wildlife art. 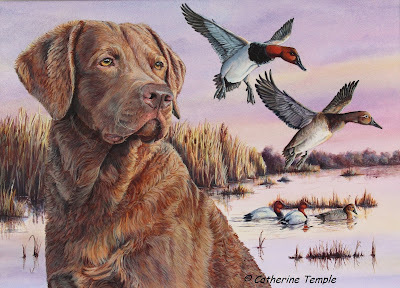 I have also created a Facebook fan page, Catherine Temple - Canine and Wildlife Art so if you're a Facebook junkie pop over there and become a fan. These are both great ways to get to know me and my art better and a way for me to connect with you! Now that I have these up and running(which has been no small feat for someone like me who only a few years ago was more apt to shoot the computer as design a website! ), I hope I can get back to some painting. While I am very pleased with these accomplishments they have really stretched me and my comfort zone. I have really started missing my paints and hope to put as much time and energy into creating pet portrait or wildlife art in the coming weeks as I have into designing a new website and fan page. And I'm sure you all would love to see some new work, too! 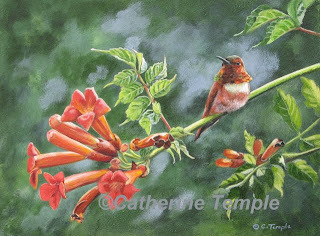 I think now I need to take a well deserved break, perhaps sit in the backyard, sip some iced tea and watch the hummingbirds play in the sprinklers. Ah, summer!! I'm taking a little break from painting this week, but I had the privilege of meeting this puppy this morning and felt I couldn't let a face like this go by without sharing. 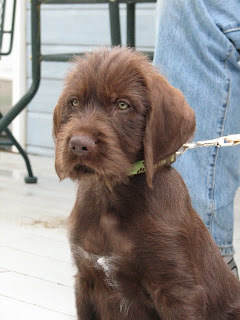 This is Snidely and he is a very handsome Pudelpointer. He is the newest addition to the household of my friends Dale and Linda and I was completely smitten with him. Dale brought him over for me to see and , of course, I just HAD to take pictures, not only because he has such an adorable face, but because I will eventually be painting him and because you just don't get to see a Pudelpointer every day! So, just what is a "Pudelpointer" anyway? Is it some type of "designer" dog that someone thought would make a cute name if they bred them? Actually, a pudelponter is an official breed though not with the AKC. They are strictly a hunting breed that originates in Germany from breedings of German hunting poodles(pudels) and English pointers. 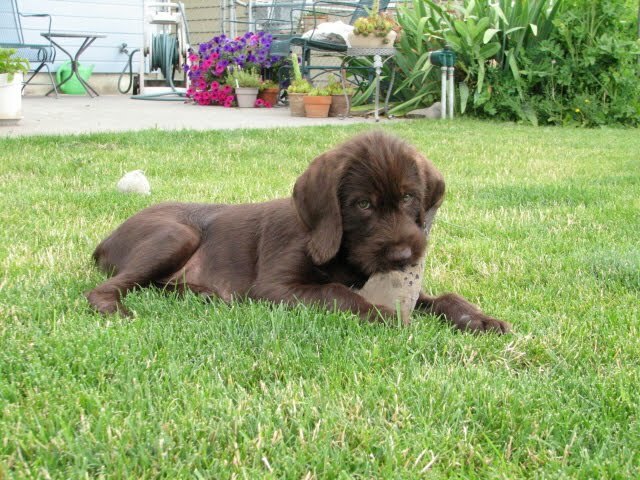 They are bred to be versatile hunters on land and water and also great family dogs. I was vaguely familiar with the name of the breed, but had no in depth knowledge of them. However, after meeting Snidely I think I will be doing a little more research on them! Shhh! 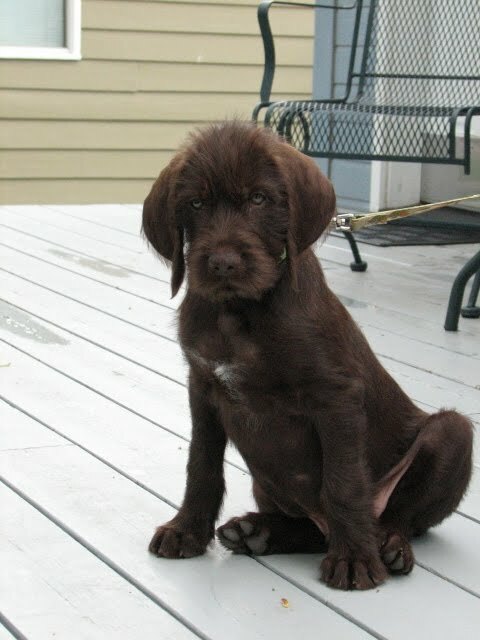 Don't tell Maggie, but I might just consider this breed for my next hunting dog! Yesterday,I posted a pair of Ruddy ducks, but I felt I needed to do another one this time showcasing the drake in his breeding plumage. They are really quite striking in their shades of red and, yes, their bills are really that blue. In the winter this bird is roughly the same color as the hen and only turns this color in the spring and summer. I noticed on my walk today that the drake was still here sleeping in the quiet back waters, though I did not see the hen. Perhaps she is nesting nearby. If that be the case I hope I am present when the ducklings hatch and they bravely swim out into the world. That would be such an awesome treat to see!! This little guy is also for sale at my Etsy store. This is another miniature painting, 4" x 5" and is in acrylic also. The price for this one is $45.00. 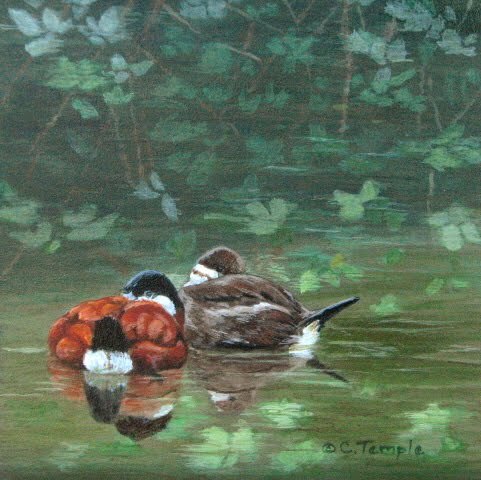 The two paintings would make a wonderful gift for a bird lover or waterfowl hunter. Maybe a great Fathers day surprise? Sitting in a quiet pool amidst the reflections of the overhanging foliage is a resting pair of Ruddy Ducks. The male sports his reddish-orange breeding plumage, while the female is dressed in soft grays and browns to disguise her from predators when she's nesting. Though they appear totally at peace look closely....you are being watched! Your presence has not gone unnoticed! I saw this pair last week resting in a backwater slough along the river where I walk. They were there for at least three days and let me approach fairly close so I took lots of photographs. I was quite taken with the males beautiful red feathers and also very intrigued by the patterns of the foliage reflections in the water. I decided to try and combine the two into one painting. Ruddy ducks are one of our smallest ducks weighing in at a little over 1 lb. and are sometimes called "stiff tails". The females are unique in that they lay the largest eggs relative to their body size and one clutch of eggs can outweigh the hen! A clutch can be from 6 to 10 eggs. Yikes! 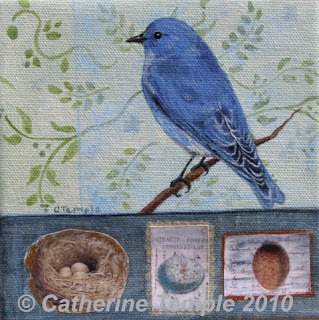 This painting is a mere 5" x 5" square and is painted in acrylic on a hardboard panel. It is available for purchase through my Etsy store for $55.00. Just click on the link and it's yours! I found some time this week to create a few more collages. I've had some ideas that I wanted to try and this was one of my efforts that turned out well enough to post. The others...well let's just pretend they don't exist!! This is a 6" x 6" x 5/8" collage on stretched canvas. It is mostly an acrylic painting with a few items collaged on to it. I was trying to create something a little more contemporary and decorative( the background mostly) while still including my signature realism and detail(the bird). I think this one turned out pretty well. I enjoyed this one a little more I think because of the simplicity of the design and that there are fewer elements glued to it. I have discovered that acrylic matte medium( the adhesive I was using) coats fingers very well and does NOT come off easily. Using vinyl gloves designed to fit my husbands hands only compounded the problem so less gluing makes me much happier! I also completed another collage at the same time that included lots of gluing, but I will post that at another time when I can think of nice things to say about it!! This piece is available through my Etsy store for $35.00 and might be just the thing to cheer up someones day! Here is the surprise painting I last spoke about! I really wanted to post it sooner, but was afraid it would ruin the surprise. This painting was for my friend, Dana, and her husband and I had to do a lot of sneaking around to get photos. He was not confident that he could get the poses I needed and we were working with a couple of deadlines. First, there was the deadline of the anniversary. Then there was the more pressing deadline of not knowing how long one of the dogs was going to live. You see, the dog in the middle, P.C., is quite old and was really starting to have problems. And as those who have pets know it's so hard to decide when it's time to let them go. But P.C. hung in there, living a good life and even having a little adventure a few weeks back. He tolerated us through all the picture taking ( actually slept through most of it! 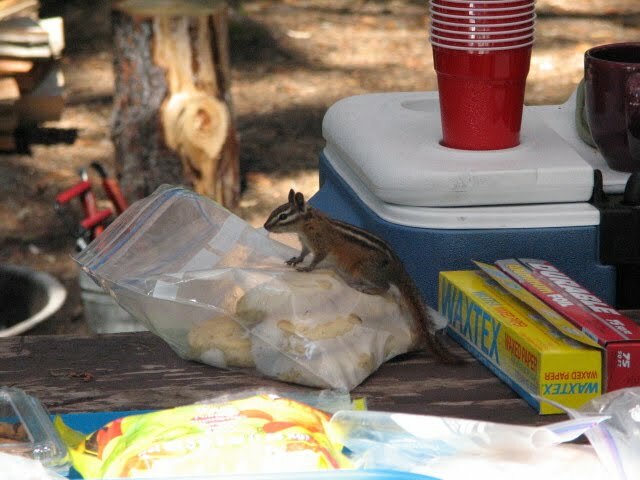 ), but was very alert when the treats came out so I was able to get a few good shots with his head up and eyes open. 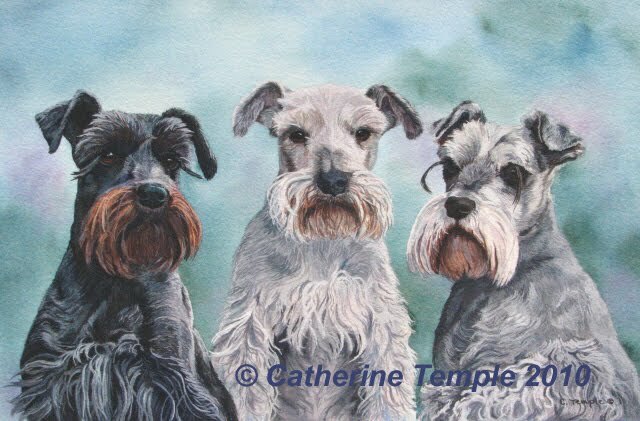 I really enjoyed creating this painting not just because it was for some great friends, but because I had gotten to know all three Schnauzers over the years. Each one was so different from the other and the two younger ones, Jasmine, the black one, and Mia, the one on the right, loved it when my husband and I visited. They especially love my husband and we joke that it's because of the mustache. He has a great, thick one and we think the dogs look at him as one of them!! P.C. was a pretty old gentleman already by the first time I met him so he was just content to greet you at the door, give you a good sniff and then find a good spot for a nap. When creating a painting for someone I try to get to know the dogs as best as I can through my clients photos and their memories. If the dogs are alive sometimes I get to meet them and that helps me to capture their personalities better. Knowing all three of these dogs helped to some degree to get it right, but some of what I do just happens as I paint. Some of it is intuitive, some of it is just knowing my materials and how dogs are put together. Often times I feel that I have a lot of help from an unseen source because I'm able to capture a look or snippet of personality that I can't possibly know about. Some people call this their "muse". I know that God has gifted me with this ability and I believe he's the one guiding my hand as I paint. He helps me to add that special "something" that really touches the ones receiving the painting. Dana called me last night to tell me how pleased she was with her surprise painting. It was especially meaningful as P.C. passed away just the week before. She told me how much she loved the arrangement of the dogs, the colors in the background, how I had captured each dog perfectly. She loved everything about it and if she had commissioned it herself would have wanted it to look just as I made it. Of course, I'm always happy to hear that I've done a good job, but I also know that it's not all me. I'm just grateful for the gifts I've been blessed with and always appreciative of that unseen help! So now it's on to some other projects! This was my last commission and I have already started on some other small works that will be for sale. Hopefully, in the next few weeks I will be posting those. Thanks for joining me here today and hope that you enjoyed the Schnauzers! Wow! I can't believe where a month just went! Seems like I just got back from my workshop and was all excited to get started on some new paintings. Since I came back I haven't had any time to practice what I learned, at least not on new wildlife paintings, but I did use some of the techniques I learned on this latest commission. This is a gouache painting for some special clients of mine of their past dog, Maxine, and their present dog, Rudy. That's one of the nice things about painting a portrait....we can create things that don't exist together in the same piece. Anyway, there is a lot of pattern in the coats of these two dogs. One of the techniques I learned was to create little windows out of paper, one for your reference photo and one for your painting. These little windows are used to isolate areas that you're working on that might have a lot of detail making it easier to see. When there is lots of texture or pattern in something it is sometimes hard for your eyes to focus on that area without getting lost. The windows help you to focus on a small area at a time so it's not so overwhelming. I used this technique extensively on this painting. I presented this to my clients last week and they were overwhelmed. There were lots of tears and hugs as it brought back memories of Maxine ( the black dog) who was very, very special to them. 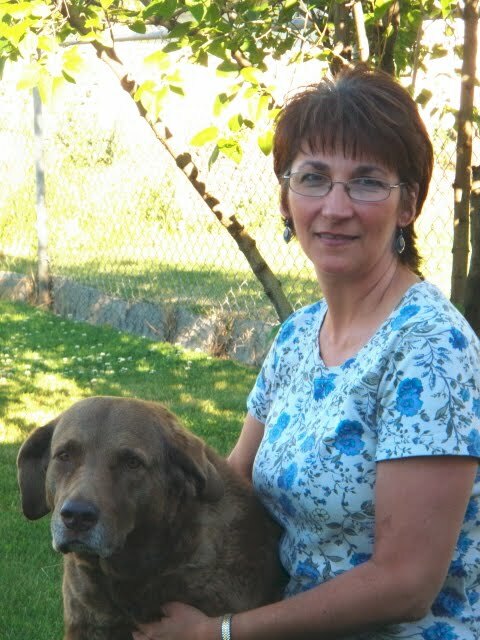 I must admit that I get a little teary eyed, too, when my clients do because I can so easily remember the feelings of loss over a pet and it blesses me to know that I have done my job well when people get that emotional. Thanks to Jim and Nancy for the opportunity to create this special painting for you! I am currently working on another commission that is a special anniversary surprise for some friends of mine so at this time I can't divulge the details as they might read about it here. I guess everyone will just have to wait until it's finished and presented to find out what it is! Good reason for you all to check back soon! 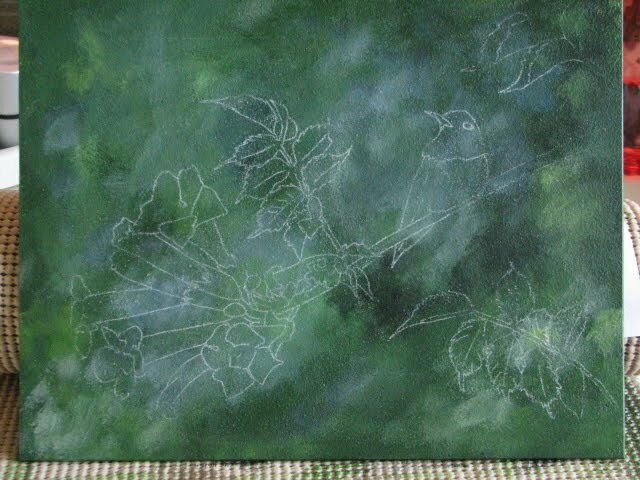 Hopefully, after this one is finished I will finally get some time to start on these new paintings. I have been collecting reference material and sketching out ideas like crazy! So...time to get back to work and get this painting done!! Hey, everyone! I'm baacckk! I just returned from my workshop in Vancouver, WA. with Terry Isaac. It was awesome, awesome, awesome!! Not only is Terry a wonderful artist, but he is an awesome teacher as well. It was three whole days of intensive learning and painting and I thoroughly enjoyed every minute of it! We covered painting techniques in acrylic, spent a little time gathering photo reference around the workshop site and talked about marketing. And we worked hard on completing a painting in the time we had. It was inspiring, exhilarating and exhausting, too! If you ever have an opportunity to study with Terry I would highly recommend it! 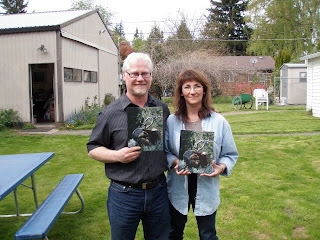 This is a photo of me and Terry with our paintings. Here we are all hard at work while Terry offers advice. 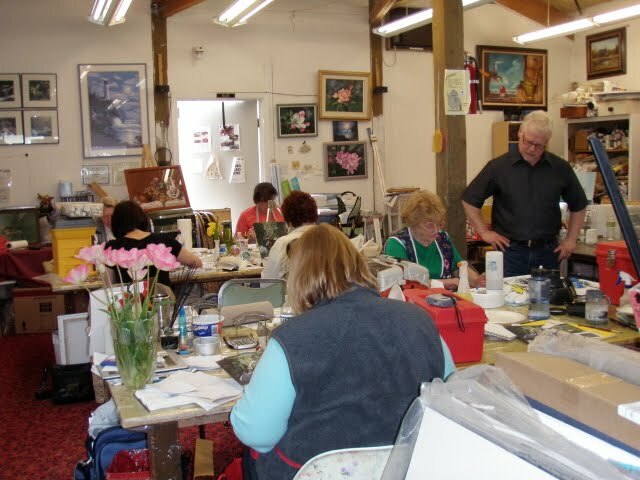 We had a class of nine people of varying ages and experience and all wonderful artists in their own right. I learned so much from the other students and it always amazes me how a group of people can all paint the same image and all create such different paintings. It was very inspirational! Thanks to Bev at Arts Desire for hosting the workshop! And here is my painting! It's actually still in progress. I had time to block in the basic areas and do a little refining, but still need to come back and tighten it up quite a bit. The foreground grasses need finishing as well as details on the elk, but even at this stage it doesn't look too bad. You have the general idea anyway! Well, now that I'm back I have a lot of information to try and digest and start applying to my own work without having Terry there to offer pointers. I'm really inspired and anxious to try my hand at this medium on my own and see where it leads me. Like my friend Judy says..."Art is a journey with twists and turns and something new to learn around every corner!" And if nothing else, it's always an interesting journey!! Early one morning I went out for my usual walk with Maggie along the river. The sun was just breaking over the hill tops and the morning was clear and still. 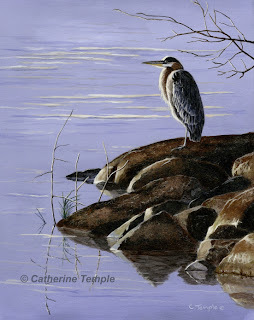 As I rounded a corner there stood a Great Blue Heron on a rocky outcropping. The early morning sun was illuminating his feathers causing a bright contrast between sunlight and shadow. He seemed to be glowing. He stood there perfectly balanced on one leg, a lone sentinel. The moment seemed magical and an idea for a painting and the title ( which will be a secret until the painting is done!) came to me all at once. Lucky for me I had remembered to bring my camera this time so the moment was recorded for future reference. This little painting is a study painting for a larger one I'd like to paint soon. It's been painted fairly loose for me and was meant to be so. I was mostly trying to capture an impression, a feeling, a moment in time. It will, hopefully, help me to work out problems on the larger painting. However, I am pleased with how this small one turned out and probably won't change too much in the final, larger painting. I know already that the larger one will be painted tighter overall and I will be adding some additional details like small twigs and branches to frame the heron, but I like the feeling I'm getting from this already. This small one will be for sale in a few weeks after I finish the larger piece. 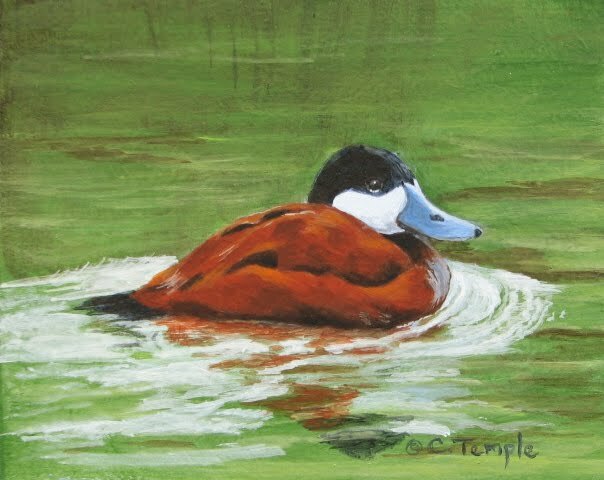 This painting is just 2.5" x 3.5" (ACEO/ATC size) and is another done in gouache. Well, I leave tomorrow morning for a painting workshop with Terry Isaac at a place called Arts Desire in Vancouver, WA. 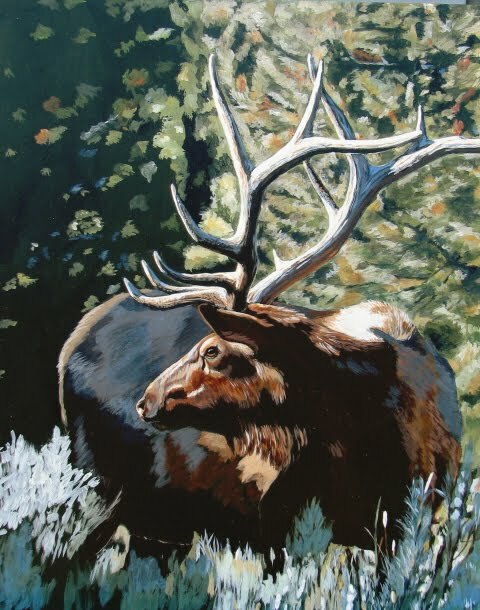 Terry is an internationally known wildlife artist who paints in acrylic. I have been interested in his work for a number of years and have been waiting for an opportunity to go to a workshop with him for about as long. I'm hoping that this will improve my ability to paint with acrylic and help me to start integrating more backgrounds and environment in all my paintings as this seems to be a weak area for me. 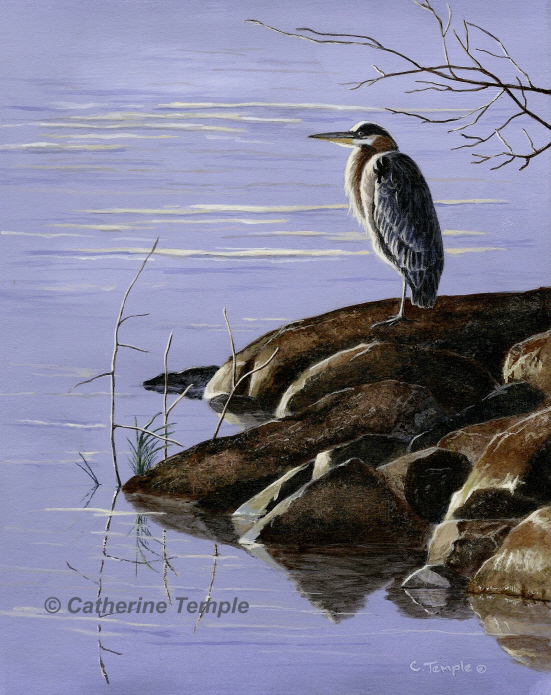 Terry likes to paint "magical moments" in nature and I'm interested in capturing those as well. I see so many special moments when I'm out on my walks and I'd love to be able to do a better job of painting those so that others, who might not have an opportunity to ever see such wonderful things, might be able to enjoy them. That's my hope and desire anyway. Guess I'd better go finish packing. I'll be gone for six days....two days of travel and four days of non-stop painting and learning! Can't hardly wait!! I expect to be overflowing with enthusiasm and ideas when I get back and will share as soon as I can. See you then!! I felt like I needed a little creative challenge ( as if doing ANY art piece isn't challenge enough!) and decided to try my hand at a mixed media art piece. I've been pondering these for awhile and thought "looks easy enough" and set about finding things to glue to a canvas. This was actually a lot of fun for me since I'm a collector of all sorts of odd bits and pieces of things. I love feathers and interesting moss, rocks, sea shells, leaves, interesting seed pods. I've been known to make my husband do some pretty crazy stuff to acquire the object of my desire and then pack it home for me. A set of deer antlers comes to mind.... never mind that they were still attached to a deer we'd found that had died over the winter.... but I'm wandering now. So, where was I? Oh yes. I collected some things and proceeded to get started. Like everything else one has never tried before there is always a learning curve and I am somewhat of a perfectionist and expect to be an expert my first time out. Now everyone, stop snickering....I know some of you are the same way. Just how hard can these things be??? Turns out the "finding things" was the easiest part, followed by the actual gluing down of everything. The parts in between were, well, definitely challenging! I really didn't have a clue as to what I was doing and should have chosen a theme before I started. My work space was covered with lots of stuff I really didn't need, all the "pretties" and unusual stuff, some wonderful papers I bought, my tools, glue, scissors. You name it, I probably had it! Eventually, I started to sort through it all and an idea started to form....sort of. After a long while of staring at it all and wondering what ever possessed me to do this, I started cutting and tearing paper and trying to place it all in some semblance of order, some "logical" progression of items. I know that collage probably has some thought process to it, but I think that some of the fun of it is supposed to be the "unordered" look, you know, kind of free form. So finally, I just said "what the heck," laid it all out nicely on my table and then had to figure out how to glue it all down without disrupting my very nice design because, of course, the first pieces to get glued down are now on the bottom of the design! And, heaven forbid, you don't want to sneeze!!! ACHOO! Papers, feathers, design going everywhere! (I'm thinking open windows, fans, any air movement is a really bad thing at this point!) Sigh! Finally, after longer hours than it should have taken, my design was complete. I have to say that I have a new found interest in this art form and a healthy respect and admiration for the artists who are able to do it and do it well. Will I try it again? Oh, probably, because there are aspects of it that are just a whole lot of fun. Going on a treasure hunt for the items, all that cutting and gluing and painting sure makes you feel like a kid again! And I think most of us need a good dose of that! This one is hot off the easel today! He's been on and off my easel for many weeks now...actually months, now that I think about it! I originally started him in acrylic, but had chosen a very slick surface to paint on. (What was I thinking????) The paint kept sliding all over and I couldn't get the effect I wanted so I set it aside....for a long time! When I finally got around to painting him again I trashed the original painting and started over. This piece is exactly what I was after all along! 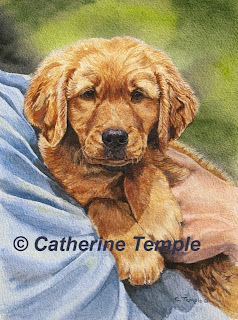 You may recognize this golden retriever puppy from previous paintings I've posted here. 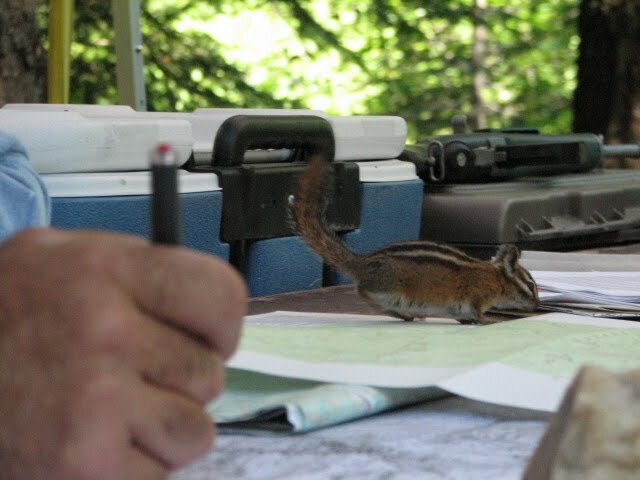 Copper has been the subject of at least three. This, in my humble opinion, is the best I've done of him. He made quite an impression on me and if you recall from previous posts he had a very bad accident and almost didn't survive. I believe that God gave him a miracle and has a special purpose in mind for Copper. I entitled this "In His Arms" for a couple of reasons. First, I believe God held this little guy in His arms the night he was injured and healed him. (Yes, I believe God heals animals, too!) Second, I'm reminded that God holds us all and this painting makes me think of that and smile. Think about it...wouldn't you just love to be held in big, strong, protective arms? How would it make you feel, especially when you're having a tough day? This painting is going to be a part of an upcoming show at the Valley Art Center called "Going to the Dogs" and will be on display from April 5 - May 1, 2010. It will be for sale there if you are interested in giving him a forever home. The Valley Art Center is located in Clarkston, Wa. and the opening reception will be Friday, April 5th starting at 5 p.m. if you'd like to stop by and say hello. Well, I'm off to create something else or maybe now would be a good time to sit back, enjoy a nice cup of coffee and something chocolate to celebrate finishing this painting. I hope you're all having a great day and if not then just join Copper and think about being held by a God who loves you! Enjoy!! I know it's early March and some parts of the country are still in the grips of winter, but here in the Northwest we are experiencing a very early spring. 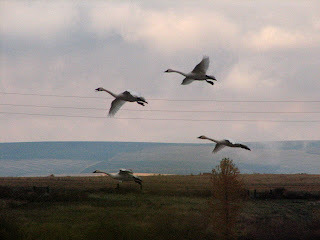 In the valley where I live birds are returning from their wintering grounds and are changing into their breeding plumage. It won't be long before they choose a mate, build nests and raise their young. 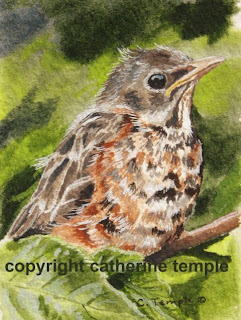 In anticipation of the coming spring I chose to paint this baby robin freshly fledged from his nest, but still dependent on his parents to feed him. This painting was done from a photo I took last summer of this fledgling. He was hiding in a raspberry bush that I was watering and I almost didn't see him. 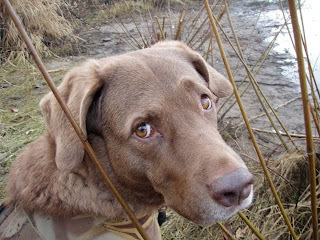 In fact, Maggie was snuffling under the bush looking for fallen berries and SHE didn't see him either. I held my breath as she snuffled right under the vine he was sitting on and it rested on her head until I called her away so the little bird would be safe. I chose to do this painting in a very small format. It is an ACEO which stands for Art Cards, Editions and Originals or may also be considered an ATC - Artist Trading Card. The standard size for both must be trading card size which is 2 1/2" x 3 1/2". The painting is done in gouache on 300lb. watercolor paper and is for sale. 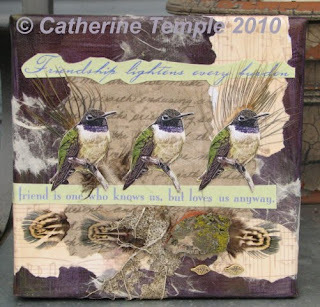 The price is just $25.00 and would make a lovely little gift for a bird or nature lover or anyone who is just thinking of spring! He is currently available through my Etsy store. Just click on the link and he's yours! This is Chloe. She is a mixed breed dog ( lab, husky, and ???) with the absolute sweetest personality. I met her a few weeks back when her owners brought her over so we could talk about their portrait commission and Chloe spent the time waiting patiently and obediently in my kitchen while we talked. She was very well behaved and was wonderfully cooperative when we took a few pictures for the portrait. It was so nice to work with such a well trained dog! I wanted to get photos of her in different light because though she is a mostly black dog she had some beautiful brown hairs dispersed through out her coat and around her eyes. Her owners wanted to be sure that could be seen in the painting. I also wanted to have a good strong light from one side so that there would be more depth to her black coat. Black dogs are always a challenge to paint and it's really important to have good reference material as so much detail can be lost in a bad photo. Good, natural lighting is important. No flash!! Her owners brought several photos taken in bright sunlight and we were able to take photos in soft, semi-cloudy afternoon light which gave us some nice shadows and detail. It also brought out the warmer tones in her coat. The result of good reference and being able to see the dog in person resulted in the portrait you see here. The background color, which I apologize for it not showing up well when I photographed the painting, was just a simple flat wash in a very light, warm tone to compliment the cool colors in her coat and bring out the warm tones. My clients were thrilled which always makes my day! Now that this commission is done I'm celebrating by taking some time to paint a few birds for fun. 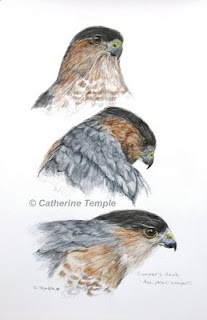 I have another peregrine falcon sketched out and will be putting some paint to that in a few days. Hopefully, my idea will come together and you'll get to see it here! Many of us are still in the grips of winter, though here in the valley where I live we are experiencing some very nice, springlike days. 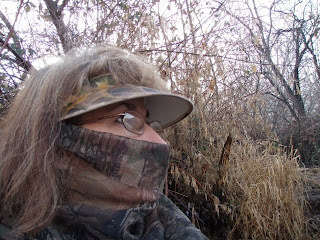 The sun was shining and I think it got close to fifty degrees today which made me start to think about the season ahead. So for my posting today I thought I'd share this wonderful little black chinned hummingbird all dressed up in his spring attire. I photographed this little fellow in my lilac bush last spring while he was taking a rest from defending the sugar water feeder. He really had his work cut out for him as I had more hummingbirds than usual last year and they all wanted an extra sip of energy as they were making their way to their breeding grounds. I amused myself by standing tucked up against the lilac bush right next to the feeder and could feel their tiny wings zipping past my head as they dove in for a quick drink. It was great fun!! My husband thought I was a lunatic until they zipped in for a closer look at him in his red shirt. He never tried standing in the bush (I really can't imagine my 6'2" husband hiding in a lilac bush...hee! hee! ), but he did take more interest in them after that. I have also created ACEO art cards, and note cards with his image on them. They are currently available through my Etsy store along with other images of my work. Thanks for looking and wherever you are today..... Think Spring!!!! I just finished my first commission of the new year. This is a Labradoodle named Bailey. He's a fun loving fellow who lives in the Pacific Northwest and enjoys duck hunting, boating and spending lots of time at the beach with his favorite humans. This painting is done in gouache and it's quickly becoming my medium of choice. I love the way it flows off the brush and it's opacity. Because it is such an opaque medium you can paint light over dark and dark over light. This really helps me when I have complex fur like the curly coat on Bailey. I can keep working back and forth over an area to achieve the texture, values and colors I need to bring his coat to life. You may be noticing that I have more background in this painting. Usually most of my portraits have a very minimal background because I like to focus more on the animal. The folks who commissioned this wanted this scene because it's special to them, but I have also decided to start challenging myself to paint more landscapes and this portrait gave me a great opportunity to try that. Hope you enjoyed seeing Bailey. 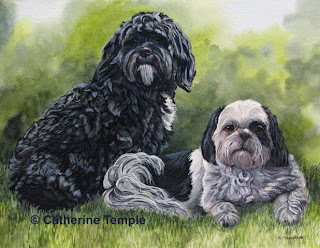 Perhaps you'd like a pet portrait of your own or for someone special. They make awesome gifts! Just give me a holler and I'll be happy to paint something special up for you! I hope everyone enjoyed their holidays as much as I enjoyed mine! I ate way too much food, laughed with friends and family and have just spent some time relaxing and reflecting on this season. Of course, like everyone else, I am starting to make plans for 2010. One of my goals for this year is to start painting more wildlife. 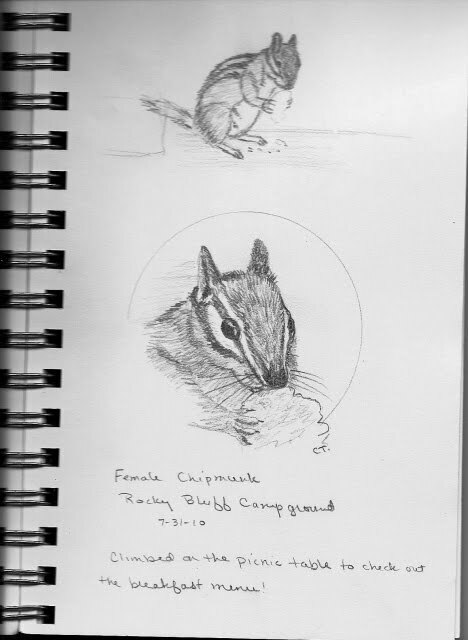 It has long been a dream of mine to be a wildlife artist. Wild and domestic creatures have always been a part of my life. I grew up surrounded by them and my first drawings were of animals... first my pets, then the wild birds and other critters that visited our property. 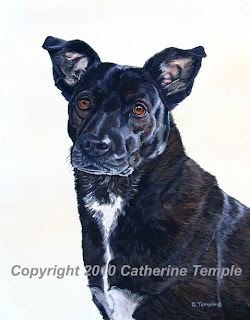 Over the years I had gotten away from painting wild creatures and started concentrating on domestic ones, especially dogs. 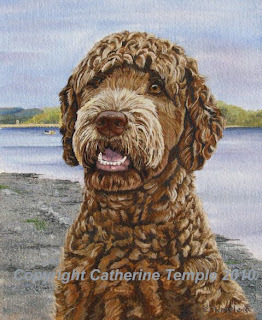 I have enjoyed that tremendously and will continue to paint them and offer my pet portraits. But now I'm feeling a strong urge to return to my first love and add that to what I'm already doing. So....here is my first one for the New Year. 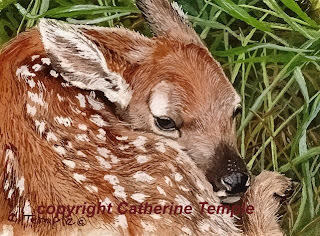 I thought it appropriate to start with this newborn fawn as he represents new beginnings. 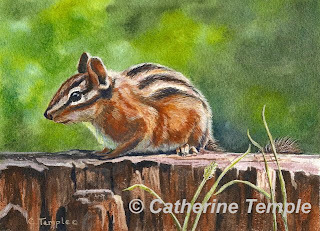 This is a miniature painting, just 4" x 6" and done in gouache. I am particularly happy with the way this one turned out. The grass was quite a challenge to do as I struggled to get the depth it needed, but I think in the end it came together well. Thanks for looking and wishing everyone the very best in 2010! !